I replaced the starter relay assembly on my 1100. The new relay came with a 10amp fuse, the original had a 30 amp fuse, I have tried switching the fuses and the original 30 amp does not work. I did have it running with the new relay, but it's my first bike and it took time to figure out the clutch and gas balance. I rode it once and it struggled trying to crank but wouldn't I'm wondering if either the battery is not charging or if the charging system is not working. The OEM starter relay comes with a 30 amp fuse. Here's a pretty good thread talking about battery and charging system diagnosing. After you test voltage at battery described in above thread post back results. Then we can help you with further testing. Strongly suggest to pick a multi meter if you are going to be working on bike. Right tools make the job easier. $10.00 at Wal-Mart. Also during my first ride I realized that the bolts that originally held the bags from the wheels where too long with just the chrome bits. I bent all four bolts and all but one I was able to remove. I drilled the head off is there a way to remove the rest without messing up the threads or The paint. And after the battery I'm going to be taped out for a bit. Easy Out extractors work pretty good. Google how to use and watch a video or two. I'm not good at reading wiring diagrams would any of you know if the lower amperage fuse that's on the new relay keep the fuel pump from running fully. I cranked the bike today and if I tried to cut off the choke or even touch the throttle it would die out, it feels like it's barely getting enough fuel to get the lower jet but not any other. The bike will out idle my patience but I'm not sure I had it running a week ago and the only thing that has changed is the battery. The pump is probably trying to die on me and that's something I really don't want to mess with, I'm tired of taking the bike apart and putting it back together. Battery is used for only starting a vehicle. The charging system takes over electrical requirements after that. The charging system tops off the charge of the battery so it's ready the next time you need to start it. The majority time a bike will not respond to choke or throttle it's a fuel deliver issue or carburetor problem. 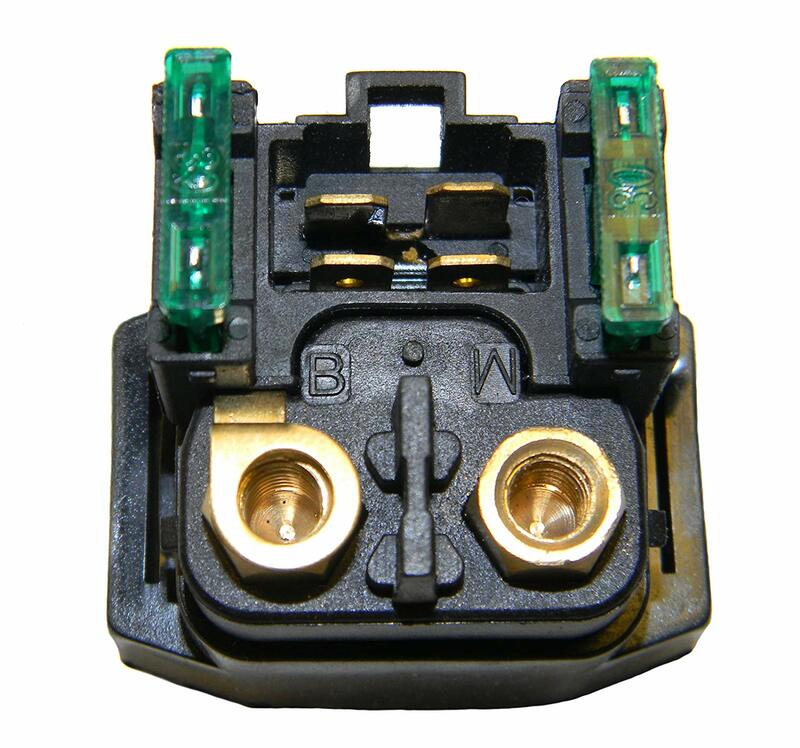 The lower amp fuse will not effect the starter relay effectiveness, but will blow fuse quickly if there is an issue. If you have at least half a tank of fuel the fuel pump really isn't needed. Many people eliminate the fuel pump on carbed Vstar bikes. The fuel pump is low pressure designed to keep a constant fuel delivery since part of the fuel tank is below carb floats. The fuel pump will only pump long enough to fill the carb bowls, usually less than 10 seconds at a time. There are many here that will assist in diagnosing your issues. Post what your bike is doing, or not doing, when you try to start it. Did it start then die. Or did it die when you moved the choke and or throttle? Would it crank back up. Was both cylinders getting hot? Did fuel pump click for a few seconds and the stop when you first turned the key on? Keep us updated. Like I said the bike starts fine first time and sounds like both sides are working but if I try to take the choke off or throttle up in the slightest it dies out. I think I'm hearing the pump work when I first turn the key but nothing the second or third consecutive time. The bike will rev I roll or shake it back and forth. With what I've seen online everyone says it's a fuel issue and they recommend cleaning the carb, but I have done that and it ran afterwards. Last edited by Dychhobbs; Yesterday at 08:36 PM.